The world is still reacting and recoiling to the Flyers' new mascot Gritty, including Stephen Colbert. 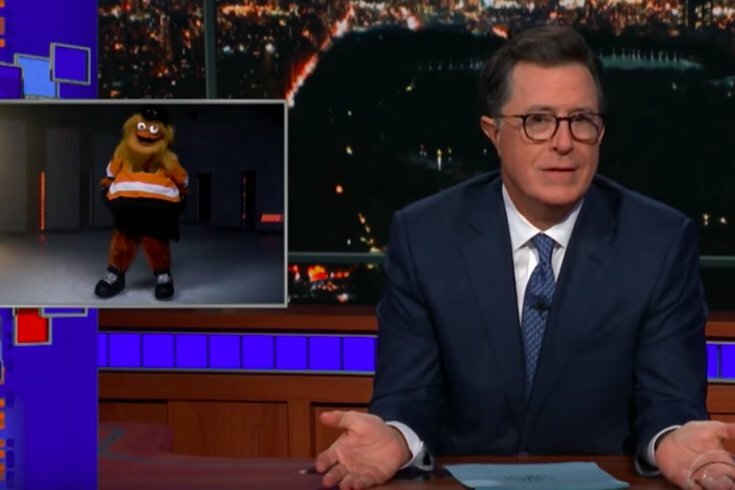 Describing the Flyers' new mascot as “horrifying,” the (now freshly shaven) “Late Show” host Stephen Colbert had a lot of fun poking fun at Gritty on Tuesday night’s episode. “I did not realize I had taken mescaline before the show tonight,” Colbert quipped. Colbert went on to relay bits from Gritty’s bio, which claim that "he’s been around for a lot longer than we know, and recent construction at the Wells Fargo Center disturbed his secret hideout, forcing him to show his face publicly for the first time." “That’s not reassuring,” Colbert said. While Gritty made his debut in person Monday at the Please Touch Museum and news of his arrival on Earth spread like wildfire on social media, it took little time for him to hit the ice – and hit it hard he did. During "The Late Show" segment, Colbert played a clip of Gritty slipping and falling on the ice at the Wells Fargo Center. “Don’t worry, that cloth extension two feet above his head was wearing a helmet,” he said. Earlier in the day Tuesday, fans also posted videos to Twitter of Gritty on center ice shooting a fan in the back with what appeared to be a T-shirt cannon.